Today I was reading a discussion about time management and I was happy to share the tool I find the most useful - iGoogle. You log in using your gmail address and, much like Yahoo, MSN, and others, you get a home page that is very customizable. I've had the MSN one before and it was trying to hard to be pretty. I wanted something practical, without lots of pictures. What good is it if you have to scroll and scroll to get the the box/gadget/widget that you're looking for? 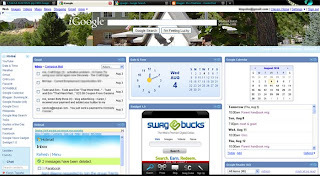 iGoogle gathers some fantastic widgets/gadgets so most of what I need is in one place. Facebook - It's nice to be able to do quick updates on here. To Do - A mock notepad to keep track of my to do list. No more losing random pieces of paper in my pockets! and a random assortment of nonproductive items like games and YouTube that come in handy when my brain needs a break. On the subject of RSS feeds, I really didn't understand what they were until about a year ago. My brother used to tell me about having an RSS thingy so he knew when there were new posts to blogs and websites, but it sounded complicated to me at the time. Turns out, it's not that hard to do and it's awesome to have. I use Google Reader since it works well with my Gmail address. When I get to a blog I like, I search for a picture like the one here or something that mentions RSS feed. Then I sign up. Google Friend Connect does the same thing as RSS but gives the blog owner the number of people connected to the blog. You can choose whether to have your connection known publicly or not. Google Reader allows you to manage your subscriptions by creating folders. I love being able to see all the tatting blogs in one folder, all the Etsy blogs in another, etc. For serious Etsians, you can subscribe to the RSS feed of your favorite shops and see whenever they add new items to the shop. There is also an RSS feed for Alchemy so you can be notified of new Alchemy requests. That one has saved me a ton of time because I can quickly browse it in my reader and not keep going back to check the Alchemy page on Etsy. A quick glance at the iGoogle page tells me all I need to know. I love it! If you have ideas to share, please leave a comment here. I can't wait to hear what works for you!